Each year, many of us begin the New Year with a list of resolutions. Some of the most popular resolutions includelose weight, eat healthier,quit smoking, and volunteer to help others. Volunteer Your Treasure. Make a one-time or recurring tax-deductible gift to the Center’s Annual Fund. The Center has an annual funding gap of $2,000 per student. The Center relies on gifts from friends and supporters to help bridge this gap. You can donate online, mail a check to the Center, or contact Kellye Buchanan at (619) 442-5129 ext. 332 or email Kellye at kbuchanan@stmsc.org. Tax ID is 95-1957332. Volunteer your Time. The Center is always in need of volunteers to help with a variety of activities and events. For more information, contact Jessica Dolliver at (619) 442-5129, ext. 333 or jdolliver@stmsc.org. Volunteer your Talent. The Center is always looking to reduce expenses. If you own a business or have skills that can assist the Center in some way, contact Laura Purdom at (619) 442-5129 ext. 110 or email Laura at lpurdom@stmsc.org. Examples of services needed include painting, gardening, and general repairs just to name a few. We invite you to check off one of your New Year’s Resolutions by making a gift of Volunteering to Help Others. 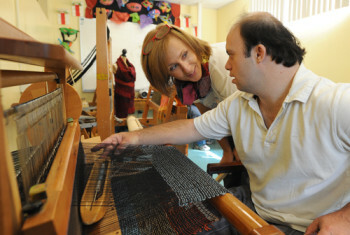 Whether it’s Time, Talent, and/or Treasure, your gift benefits 400+ adult students with developmental disabilities at St. Madeleine Sophie’s Center. Click here to send your gift TODAY.